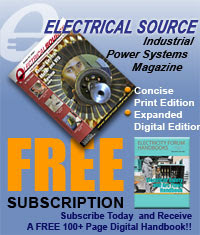 Consider a capacitor C in series with the resistance R. The capacitor has initially no charge and no voltage across it. When the switch is closed at the instant t = 0, the charge starts accumulating on capacitor and current starts flowing. This is maximum charging current. 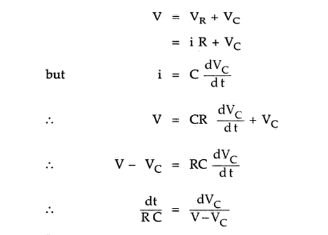 As capacitor starts charging, the capacitor voltage VC increases and finally after a certain period achieves a value equal to V.
Then the charging current reduces to zero. Theoretically, the current becomes zero only after an infinite time. 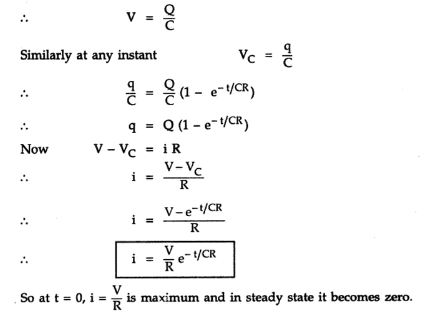 In actual practice the voltage across capacitor and current achieve their steady state values equal to V and zero respectively, in a relatively short time. The variation of charging current and capacitor voltage VC against time is shown in Fig. 2 (a) and (b). 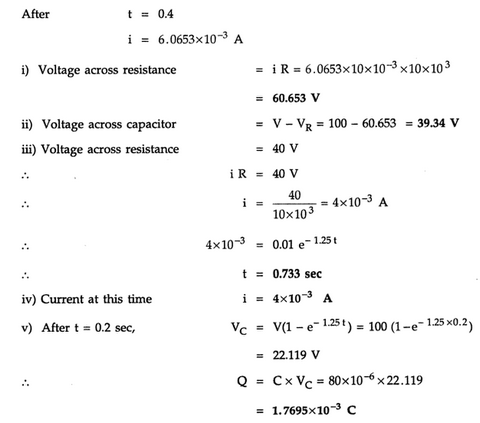 Let VC = Voltage across capacitor at any instant. 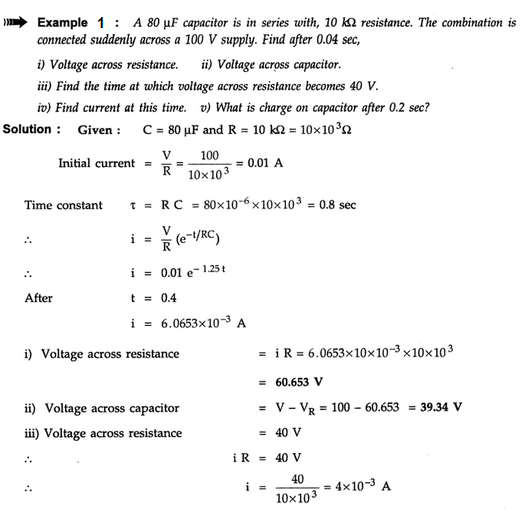 q = Charge on capacitor in coulombs at any instant. i = Charging current at any instant in amperes. Where k = Constant of integration. When the steady state is achieved, the total charge on the capacitor is Q coulombs. Thus capacitor acts as short circuit and in steady state it becomes zero. 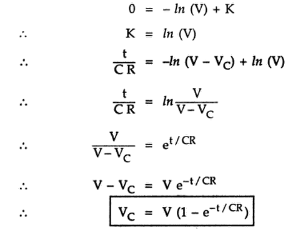 The term CR in all the above equation is called the Time Constant of the R-C charging circuit and denoted by Ԏ, measured in seconds. So time constant of the R-C series circuit is defined as time required by the capacitor voltage to rise from zero to 0.632 of its final steady value during charging. Incidentally after t = 2Ԏ, 3Ԏ, 4Ԏ the capacitor voltage attains the values as 0.863 V, 0.95 V, 0.982 V respectively and practically capacitor requires the time 4 to 5 times the time constant to charge fully. Note : Time constant is the time required for the charging current of the capacitor to fall to 0.368 of its initial maximum value, starting from its maximum value. 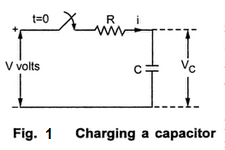 The initial rate of rise of capacitor voltage is fast however when the capacitor charges this rate is reduced. 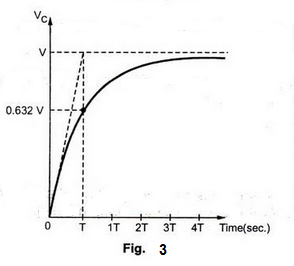 Thus the tangent to the initial part of VC joins VC = V at t = Ԏ as shown in the graph. 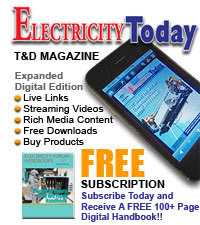 From the above discussion, the time constant of R-C series circuit can be defined as the time in seconds during which the voltage across the capacitor, starting from zero, would reach its final steady value if its rate of change was maintained constant at its initial value throughout the charging period.